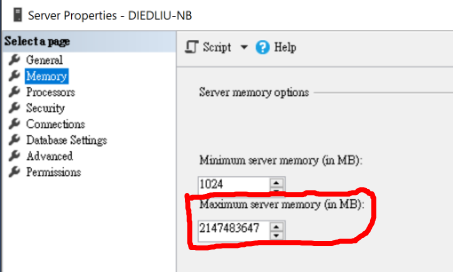 Few days ago I am testing a issue, set maximum server memory to very low (min limit 128 if you set the value below it) on SSMS, after apply the setting, SSMS pop out error , broken connection from SQL server and can't connect back due to the memory to low can't accept connection. I take some time to find out how to change the setting from command line, here is the guide. I am not sure this step need or not, but I stopped sqlserver before start following step. to start sqlserver, after it started, leave it on. After that, the problem should be solved, you can try using SSMS connect to DB to test it.